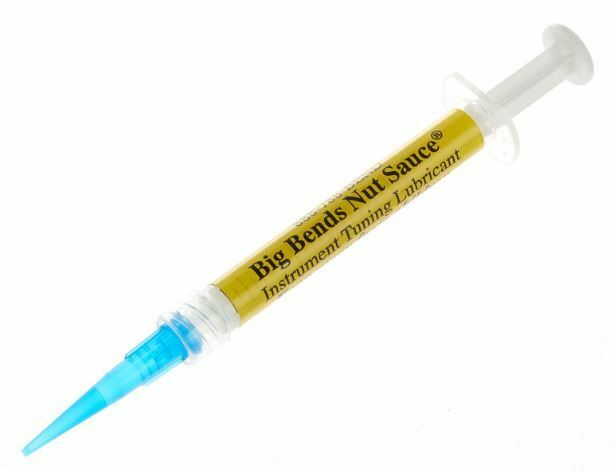 Big Bends Nut Sauce - yes, it strikes a chord with your funny bone, but more important is what it does for your guitar. It keeps you in tune and ends string breakage problems. Big Bends Nut Sauce - yes, it strikes a chord with your funny bone, but more important is what it does for your guitar. It keeps you in tune and ends string breakage problems. Now in 2015, Nut Sauce has often been imitated by the big box guys, but it's never been copied! Created by Jeff Massey (an obsessed guitarist) looking to stay in tune while playing songs like Lenny and Riviera Paradise, on a Strat with a floating bridge (yes you can un-block the bridge and use the whammy bar without worry). Nut Sauce soon became an overnight hit with professional guitarists and guitar techs across the globe.